It was going to be a long summer, one of those that burn your eyeballs with the blast of lipstick colour from all those new bestsellers that Goldie Graham just finished stacking like sliced salami along his shelves. I needed a fix. Something new. And I needed it bad. Something to get me through weeks of baking sun and sand, only an occasional dip in the ocean to break the monotony. ‘Hey, what d’ya think of this one?’ said Goldie. When Goldie picks you a winner, you know it’s going to race home with a furlong to spare. And I could feel it in my guts. This one was a thoroughbred. Pure style. Sleek sable cover that matched the title – The Black-Eyed Blonde: A Phillip Marlowe Novel. Snow-white lettering too, screaming at me like the little girl lost that this little number was all about. Still, I knew there was something phoney when I saw the scribbler’s name. Benjamin Black. It sounded familiar. But when I saw his mugshot I pulled up sharp. A yo-yo on the end of its string. ‘Wait, Goldie,’ I said. ‘I know this guy, staring at the face of the Irishman. 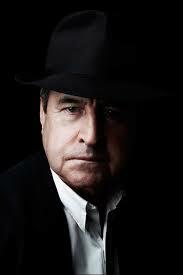 ‘Isn’t this Banville, the same finger who won the Man Booker prize a while back?’ And it didn’t end there. This Banville character was pretending to be somebody called Benjamin Black. And Black? You’ve got it, sister. He was pretending to be Raymond Chandler. Making a pretty good fist of it, too. He was right. In this one, Marlowe’s as tired of life as he’s always been. His only hobbies are smoking cigarettes and playing solo chess. But, once in a while, 1950s Los Angeles also turns up a case to curl the toes of the toughest Private Eye. That’s where this Langrishe broad comes in. The boyfriend, Nico Peterson, has disappeared and Marlowe’s hired to find him. Well, by the end of the first chapter I was caught like a snapper on a Number Two keeper hook. All the one-liners. The wonderful prose of Chandler himself. 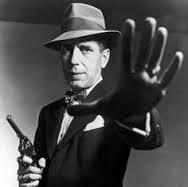 And Bogey’s weary voice whispering to me through every line. As it happens, I’m no sap myself when it comes to Chandler. Hell, I know the text of The Long Goodbye and Playback like I wrote them myself. So, by Chapter Seven, I figured I knew where this one was going. And then this Banville socked me with more twists than a sommelier’s corkscrew. Sun and sand? Yeah, there’d be all that. But there’d be the mother of all rollercoaster rides too! 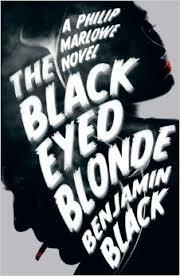 The Black-Eyed Blonde: A Phillip Marlowe Novel, by Benjamin Black (John Banville), was published in March 2014 by Mantle. I loved it!